More high fives and smiles! 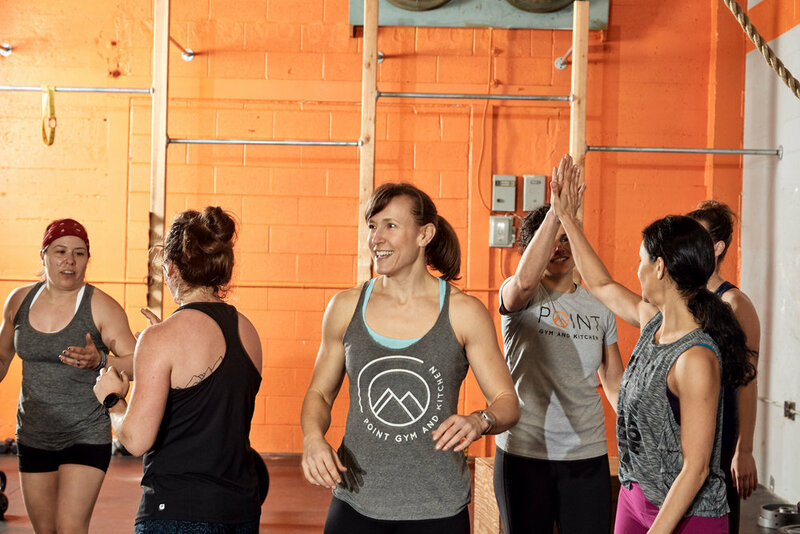 One commitment we had when we opened was to keep our classes small enough that it would feel like a community. We wanted to get to know our members and have our members get to know each other. Staying true to this sentiment allows us to appreciate our business for more than just our livelihood. Our lives are enriched by all the people who sweat on our floors. Everyone who comes through our doors teaches us lessons about the world and for that we are truly grateful. Below you will find just a short appreciation for all of our current members who make POINT a truly wonderful place. Some of them are silly, some are sweet, but all are heartfelt. Thanks for a great year, everyone! Give yourself a high five! Amarylis F - We appreciate you sharing your perspective on wellness with others. Amy V - We appreciate your work ethic in workouts. Anna R - We appreciate your uplifting mood as a staple of our evening classes. Annie K - We appreciate your focus on quality of movement. Beth B - We appreciate your humor, your long underwear, and your dedication to getting your first pullup done the right way! Brooke R - We appreciate your dedication to all your PT after your workout. Caitlin C - We appreciate how freakin hard you work in class! Cesa S - We appreciate your dedication to the gym even though you have so much going on with school and jobs! Chaise J - We appreciate how you use POINT workouts to facilitate your love of biking and running. Daniel S - Even more than putting the signs out, we appreciate how you make everyone feel so welcome - especially new members! Danielle B - We appreciate how when the workout starts, you put your head down and get it done! Ember K - We appreciate all your outdoor adventures! Thank you for living the POINT mission! Emily O - We appreciate having you back at POINT and for showing everyone that new moms can take time for themselves. Farrell R - We appreciate your dedication to your knee rehab so you could meet your running goals… Nice work this year! Gina K - We appreciate your ability to bring bring the mood up even when there are so many burpees! Jamie H - We appreciate you being the only one that had a year-end MovNat goal! Ken K - We appreciate your seemingly endless good mood. Kirsten I - We appreciate your embodiment of the POINT philosophy: Train Indoors. Play Outdoors. Kristin V - We appreciate your “beast mode” in the gym and your “badass-ness” outside the gym. Lauren T - We appreciate your SEO genius and your willingness to help our small biz! Mason K - We appreciate your dedication to work-life balance. We know how hard it is to start a business… Keep it up! Matthew S - We appreciate how excited you get about using your POINT skills outside the gym! Mel D - We appreciate you celebrating your special occasions at POINT! Michelle C - We appreciate your awesome POINT coaching skills on Saturdays! Nicole M - We appreciate your commitment to MovNat! Nikki B - We appreciate how you approach the rocks that weight as much as you do with no fear! Osa E - We appreciate that you kept showing up… and also that you are now taking important time off. Sam Z - We appreciate how you are taking your recovery in stride and actually giving yourself time to build true strength and heal. Shawn S - We appreciate the energy and lightheartedness you bring to the evening crew! Sherri S - We appreciate you giving back the message of health to your students! I am so excited to announce that as a BirthFit Certified Coach, I now offer support, training, and guidance to women and their families in all stages of motherhood and parenthood. If you or someone you know is pregnant, wants to become pregnant, has ever been pregnant, or is postpartum, BirthFit is for you. As a BirthFit coach it is my goal to empower women to be an active participant in their health, before, during, and after pregnancy. You can continue to train, move, adapt, set and break new goals, and embody power and strength in all stages and all representations of motherhood. Pregnancy is not a handicap, nor is it an injury; it is a miraculous demonstration of your body’s ingenuity, strength, and resilience. My goal is to prepare you physically and mentally for pregnancy, birth, and postpartum. We live in the Pacific Northwest, arguably and biasedly, the most beautiful corner of the world! We could pretty much drive in any direction and be somewhere remote and beautiful within an hour. That said, most of us don’t have a 2 hour round trip window to work with every time we want to get outdoors, especially on the weekdays. Fear not! Over the past 9 years I’ve made it my life’s work to find every nook and cranny of nature left in our fair city. Below are my four recommendations; some you may have heard of, others not, but all can have you in nature within 10-20 minute from your office or doorstep. We’ve said it before and we’ll keep saying it again and again… We continue to be so thankful to have a community and platform from which to ask for help and get support for causes that need it the most. It is pretty overwhelming to think of all the people that could benefit so greatly from things we take for granted. We are passionate about many different organizations that all need extra support right now so we have decided to choose a few we love the most to sponsor during our annual POINT donation drive. How you can help: Just choose from one (or more) of the organizations below based on your own passions, take a festive tag from the gym and fulfill the request on the tag, drop it off at POINT when you come for your next workout, and we will drop it off for you! Don’t actually attend POINT? You can still swing by and grab a tag or just use the lists below as inspiration and donate on your own. This got me thinking about other ways we compartmentalize different “groups” of people all the time and how this hinders our progression toward any sort of equality. Bookstores, movie genres, types of music... We are obsessed with putting ourselves in boxes and highlighting differences. Except that, curiously, I have never seen the genre “white movies” or “heterosexual novels” thus furthering everyone's perception of what is “normal” and what is a sub-category. How many of you, men included, would want to wear a corset every day? Sure, maybe every once in a great while for a very *special* occasion, but Every. Single. Day??? We stopped wearing corsets regularly a long time ago… They are impractical and unhealthy. You can’t breathe properly in a corset and they can permanently alter the structure of your ribcage if worn long-term. And they are UNCOMFORTABLE! Why has this same realization not been made with our shoes?!! No need to lose sleep (haha!) if you missed Part 1 on how resetting your Circadian Rhythm can help you sleep better; you can find it right here. If you are ready to feast on Part 2, grab a fork and let’s dive in! Part 2 is all about how your nutrition can impact your sleep. Which phrase do you hear all the time: “diet and exercise” or “nutrition and movement?” Which phrase resonates with you the most? For me, diet and exercise sounds restrictive and compartmentalized, implying how we should eat and move our bodies. Nutrition and movement seem personally intentional - how we choose to fuel ourselves and how we move throughout life. Introducing Madeline and Holistic Yoga Therapeutics™! Hi everyone! I am so excited for the opportunity to work at POINT with all of you. If you are new to the concept of Holistic Yoga Therapeutics™ it could be described simply as “movement therapy,” although it is so much more than that! It is for anybody, whether you do yoga or not. The “Yoga” part of the name implies where it derives its principles of alignment, breathing techniques, and the approach of viewing each individual as a whole. We know so many of you struggle with chronic pain, are recovering from an injury, have specific fitness goals, feel “tight” in your hips/shoulders/low back/etc., or just generally feel limited by the functionality of your body so we are thrilled to be able to offer a service that encourages healing THROUGH movement, rather than by limiting it.